This was my first true waterfall that emptied into the ocean. In this case Man o'War Brook empties into Somes Sound. Obviously the view of the waterfall is best from the water but the side view from the edge of the cliffs was still nice. As with Hadlock Falls the water flow was low due to dry conditions. Still, it's an easy hike through Acadia National Park and worth the effort IMO. The best parking place for the hike is in a small, unmarked gravel parking area on the east side of Rt. 102 about 1/8th mile north of the larger, paved Acadia Mountain parking area. This gives you direct access to the abandoned fire road. I've put together a little Google map of the parking area along with the approximate path to the waterfall via the old fire road. I highly recommend printing this out to help on your hike. You can also just click through the map below and customize directions as needed. The hike to Man o'War Brook Falls is approximately 2.0 miles roundtrip from parking. Elevation gain from parking is minimal, a little up and down as the road meanders through the woods. When the old fire road disappears the going gets a little tricky. It's been over 2 years since I was there but I definitely recall some confusion at a large trail intersection. I ended up going left which was the right way. From there it is less that a quarter-mile to the waterfall. 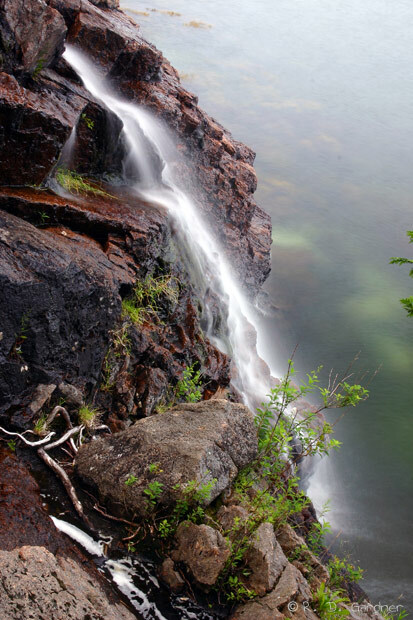 Start looking for an unmarked trail that goes steeply down the hill towards the water for a view of the waterfall. Hope this helps. At least you have good GPS coordinates. The ones published on the web elsewhere are wrong. I was there and marked the site personally. You will definitely want to lug your tripod up here as the low water flow and uneven surface make for much difficulty in getting a good shot. Ok, I can't say that I got a good shot but it would've been much worse without a tripod. The waterfall was not exposed to direct sunlight (a good thing) since it was late afternoon and it faces east. Not a good waterfall for morning shots, try to get here late afternoon as I did for your best potential. Try to bring a wide angle zoom lens if you have one. My shots varied from about 50 mm down to 20 mm.